The science behind the Megabomb header may be our greatest engineering accomplishment to date. You can bolt on a Megabomb with an existing FMF Racing slip on for as much as a 3hp boost, plus the Megabomb actually reduces noises levels by as much as 1.5dB. The Megabomb technology is revolved to produce more low end to mid range gains as well as broadening out the mid to top end power gains over stock. The Megabomb is best used for Motocross/Supercross and GNCC style trails. Used by Factory Teams, the Megabomb is the next level technology you can have today. For use with FMF mufflers only. Produces long header torque and short header over-rev. Reduces sound output as much as 1.5dB. Increases output from stock motor as much as 3hp. Made from premium American material. #1 Header in 2011 Supercross, Motocross, Motocross of Nations and Monster Energy Cup! If you have a po box, please provide BOTH the po box and physical street address. Some items may have a slightly different appearance than what is shown in the picture. 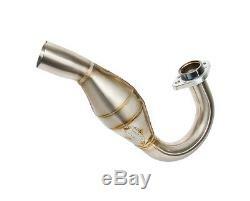 The item "FMF Megabomb Head Pipe Header Suzuki RMZ 450 08-10 Stainless Steel Exhaust" is in sale since Monday, December 16, 2013. This item is in the category "eBay Motors\Parts & Accessories\Motorcycle Parts\Exhausts & Exhaust Systems\Other Exhaust Parts". The seller is "fullcirclepowersportsco" and is located in Longview, Washington. This item can be shipped to United States, Canada, United Kingdom, Denmark, Romania, Slovakia, Bulgaria, Czech republic, Finland, Hungary, Latvia, Lithuania, Estonia, Australia, Greece, Portugal, Cyprus, Slovenia, Japan, Sweden, South Korea, Indonesia, Taiwan, South africa, Thailand, Belgium, France, Hong Kong, Ireland, Netherlands, Poland, Spain, Italy, Germany, Austria, Mexico, New Zealand, Philippines, Singapore, Switzerland, Norway, Croatia, Malaysia, Brazil, Colombia, Bahamas, Viet nam.